It was to be the showbiz event of the year, but Sir Paul McCartney's one-off appearance at Liverpool's Cavern Club after a gap of more than 60 years last Thursday, fell flat when nobody turned up. The performance was ticket-only, and the superstar's fans were told there were free ones available to the first 100 people that turned up to collect one. Nobody bothered. "Yeah, I remember im. Wasn'ee the feller in Wings?" "Isn'ee dat bloke who sang Mulla Kintyre? I like dat - it wuz grreat!" 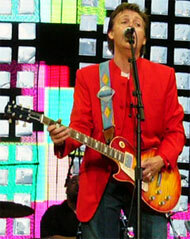 McCartney - or 'Macca' as he often likes people to refer to him - has never stopped making music since the Beatles days, even though some of his output has been extremely questionable. Organisers of the gig, however, had expected the mere mention of his name would be enough to put his fans under a spell, and draw them trance-like to the Cavern Club one last time, but it was not to be. "Awish ad known - avallus wanted to be hypnotized!" Paul McKenna was unavailable for comment.